Available to let on Flexible Terms or on a 12 Month Licence. The accommodation comprises the entire first floor of the two storey offices situated at the front of the building on a secure gated yard. The accommodation is accessed via stairs from the small shared reception. The space provides 2 areas which have been split by demountable partitioning - the main offices which has been divided into a boardroom, one office and the main open plan offices together and a smaller area with two offices and store-room. There is both male and female toilets and a kitchen. The accommodation has been fully refurbished to a high standard with Cat 2 lighting, Cat 5 cabling, new carpets and double glazing. There is gas central heating and air conditioning. 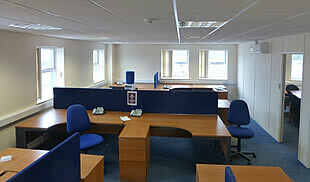 The offices also benefit from a dedicated intruder alarm. 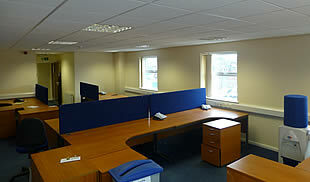 The overall sense is of quiet well lit space with good natural daylight. There are to be 8 allocated car spaces. 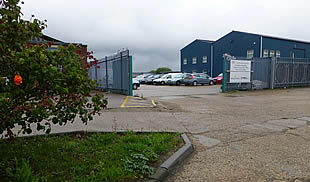 The property is located on the well-established Riverside Industrial Estate in Dartford behind the former Glaxo Welcome buildings. 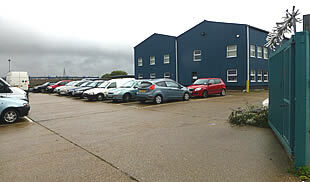 The estate provides a range of units, many owner occupied. Chapter House is located towards the rear of the estate on a self-contained site. A due proportion of the total rates payable for the building will be required. Click the EPC logo to download the Energy Performance Certificate. Riverside Industrial Estate - Estate occupiers, types of building, planning uses, transport, ownership, etc.